In the southeastern part of the Nara Basin, keyhole-shaped mounds of the early type are densely situated and form the Ôyamato tumuli area. 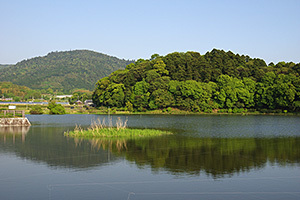 Among the kofuns in this region, Hashihaka Kofun is not only large, measuring 280 meters in length, but also of the earliest type. Recent dendrochronological studies (studies using tree rings of timbers from archaeological sites) suggest that the conventional archaeological dating of the Yayoi and Kofun period should be shifted to several decades earlier. Accordingly, the beginning of the Kofun period, and hence the construction of Hashihaka, may date back well into the middle 3rd century. 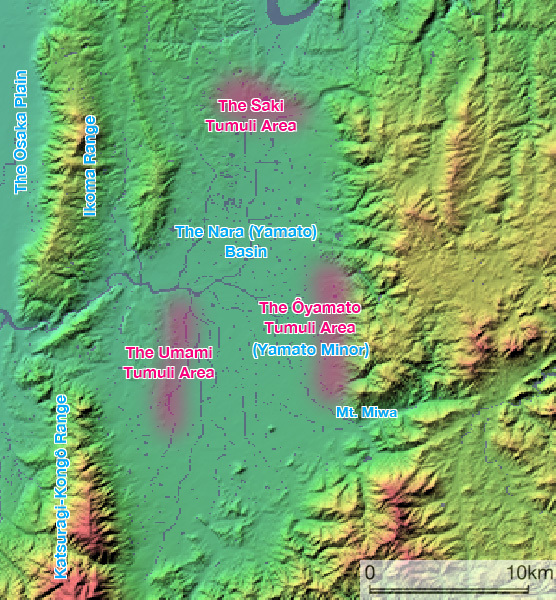 Tumuli areas in the Nara Basin (in red letters). Digital elevation data are from the Geographical Survey Institute of Japan. It is suggested that, while the place name of Yamato covered a wide area including the Nara Basin throughout various historical ages, it specifically referred to the southeastern part of the Nara Basin in prehistoric times. 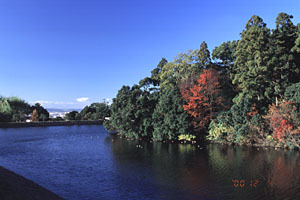 This region of Yamato Minor is considered the cradle of the Yamato Kingdom, predecessor of the Japanese court. Nihon-shoki, a chronicle of Japan compiled in the 8th century, contains the following old legend about the woman buried in Hashihaka. Yamato-Totohi-Momoso-Hime, aunt of the king of Yamato (Emperor Sujin), was wife of the deity of Mt. Miwa and a priestess able to transmit the deity’s words to the king. Because she offended the deity, she was killed and buried in Hashihaka (see Nihongi translated by W. G. Aston, pp.158-9). Some scholars recognize a similarity in character between the legendary woman buried in Hashihaka and the queen of prehistoric Japan named Beimihu [Himiko] mentioned in Sanguo-zhi (History of the Three Kingdoms: The Chapter on the Eastern Barbarians in Wei-shu), a Chinese history compiled circa 297 AD. According to the accounts on Wo [Wa: prehistoric Japan] in Sanguo-zhi, Japan in the 3rd century was a confederation led by the Yematai [Yamatai] state. The queen of Wo, who resided in Yematai, was an unmarried female shaman who possessed magical powers and ruled the territory with her brother. She dispatched envoys to the Wei dynasty of China several times in the middle 3rd century. When she died, the Chinese record says, a large mound was made for her burial. 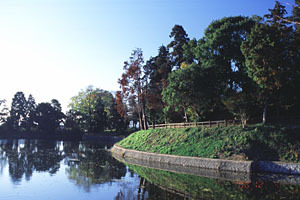 There have been a great many disputes about the location of Yematai, with northern Kyushu and the Nara Basin being the major candidates. Because of the recent shift in archaeological dating, increasing number of scholars have come to support the position that Yematai was located in Yamato Minor i.e. the southeastern part of the Nara Basin. 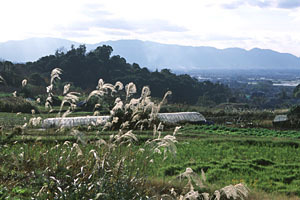 Tsude, H. (1987) ‘The Kofun Period,’ in Tsuboi, K. ed. Barnes, G. L. trans. Recent Archaeological Discoveries in Japan, UNESCO, pp. 55-71. Brown, D. M. (1993) “The Yamato Kingdom,’ in Brown, D. M. ed. The Cambridge History of Japan, Volume 1, Ancient Japan, Cambridge University Press, pp. 108-162. Okazaki, T. (1993) ‘Japan and the Continent,’ in Brown, D. M. ed. op. cit. pp.268-316. Farris, W. W. (1998) Sacred Texts and Buried Treasures – Issues in the Historical Archaeology of Ancient Japan, pp. 9-54. Shiraishi, T. (2000) Kofun no Kataru Kodaishi, Iwanami Shoten. [Left column; top to bottom] Kurozuka Kofun, Andon-yama Kofun, Shibutani-Mukôyama Kofun and Hashihaka Kofun. 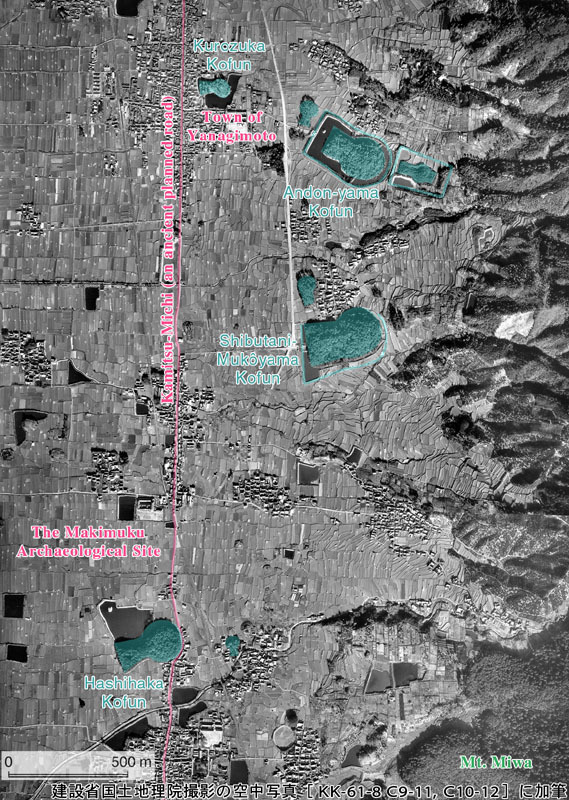 [Right] An aerial photograph over the southeastern part of the Nara Basin taken in 1961 by the Geographical Survey Institute of Japan (mosaicked and retouched).